The five senses (sight, hearing, taste, touch, smell) are all important to accomplishing daily tasks. Other than taste, the senses are important to help drivers stay safe on the road. Sight is obviously crucial to driving, helping you see the road, hazards, signs, and signals. The other senses might not seem obvious, but they are important too. This is the second most important sense to operating a vehicle. The roads are full of sounds that help you navigate around town safely. For instance, other cars honk their horns to help alert you to a changed traffic signal, a potential danger ahead, or if you are about to collide with each other. This one sound is so powerful that it makes all the surrounding drivers look around and assess conditions. Emergency vehicles: You often hear them before you see them, which helps you pull over and get out of the way. Railroad crossings: When a train is approaching, they often blow their whistles to alert drivers to their arrival. The railroad crossing arms are usually equipped with a machine that makes a sound to add another alert of the incoming train. Brakes: When drivers push the brakes of their car really fast and hard, they make a specific, squealing sound. Hearing this sound should cause you to look around and notice any problems around you, including an accident happening around you or even an animal in the road. GPS: If you are driving somewhere unfamiliar, you need to listen to the directions being given to arrive at your destination safely. Mechanical functions: If you hear funny sounds coming from the car, it’s important to take it to a mechanic. Some sounds alert you to serious mechanical problems. 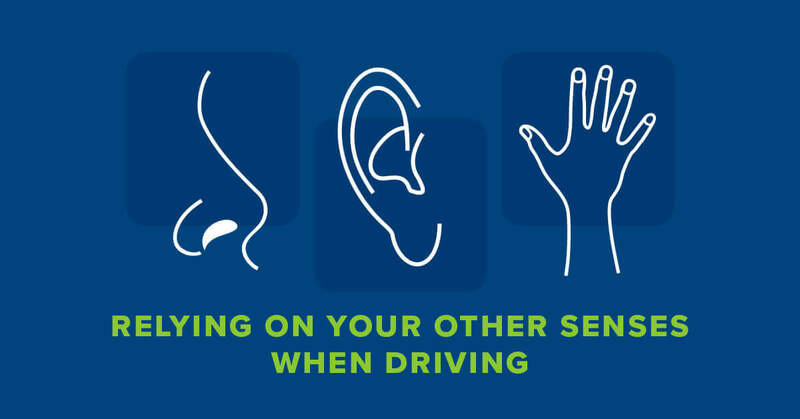 The ability to hear is important to helping you stay safe on the road. Make sure your radio or podcasts aren’t so loud that they drown out the sounds around you. The ability to touch in the car is important to operating your vehicle safely. Finding the necessary buttons and dials gets easier the more familiar you are behind the wheel of that car. Instead of needing to look at the dashboard to find volume dials, radio stations, headlights, blinkers, and windshield wipers, you learn to find them by feel. This helps you concentrate on the road and your surroundings. Another way that touch helps you drive better is that you become familiar with the feel of a car. Certain problems with the tires, like a leak or an alignment problem, pull your car to the side. If you know the feel of your car and keep your hands placed properly on the wheel, you are aware of potential problems, but also have better control of your vehicle. Recognizing these scents help you to know how to treat the problem. Using your senses while driving might seem like a lot of things to pay attention to, but they become second nature the more you are behind the wheel. Utilize these abilities to help you stay safe on the road.